Students watch as the first 3D printer in all of Badakhshan province begins to print a model. "I came to Tajikistan with an open mind and no expectations necessarily of what the country would be, and it turned out to be an absolutely amazing experience. Being able to do this programme with my wonderful students made for a summer that I know I’ll remember forever." -Faith Harron, Stanford undergraduate, Cardinal Quarter Fellow and Makerspace teacher. What were two Stanford University engineering undergraduate students doing spending their summer in Khorog, Tajikistan, a town of 30,000 people, nestled in the Pamir mountains? While immersing themselves in local culture, Faith Harron and Allison Armstrong were teaching the Makerspace curriculum at the Aga Khan Lycée, an Aga Khan Education Service (AKES) school. A Makerspace is a collaborative work space inside a school or other facility to provide creative ways to encourage students to design, experiment, build, and invent, as they engage in science, engineering, art, and other creative projects. This nine-week programme provided an opportunity to engage 41 Grade 5 students in creative, higher-order problem-solving through hands-on design, construction, and iteration. They experimented with new technologies and equipment, whilst also contributing towards their interdisciplinary understanding of Science, Technology, Engineering, Art, and Mathematics (STEAM). Growing up in the small town of Bismarck, North Dakota, Faith said she did not have the opportunity to explore her STEAM interests, but since coming to Stanford she has been encouraging her friends and others to "to dream higher." She added: "That’s one of the things most important for a student, to have people that believe in and support them in their dreams, and that’s what I wanted to do with this programme in Khorog. A Makerspace like this one is so important for the community here." Having completed the Cardinal Quarter Fellowship programme, a part of Stanford's Haas Center for Public Affairs, Faith and Allison were selected to implement the Makerspace initiative, co-sponsored by the Aga Khan Education Service (AKES) in Tajikistan, and the Aga Khan Lycée. This initiative stems from the Agreement of Cooperation between the Ismaili Imamat and the State of California, signed in 2009. The Agreement calls for collaboration in a range of fields, including partnerships in the field of education. Partnerships through faculty and student exchanges, teaching, curriculum development, research, capacity building, technical assistance, and continuing education programmes, among others, are envisioned as a result of the Agreement. 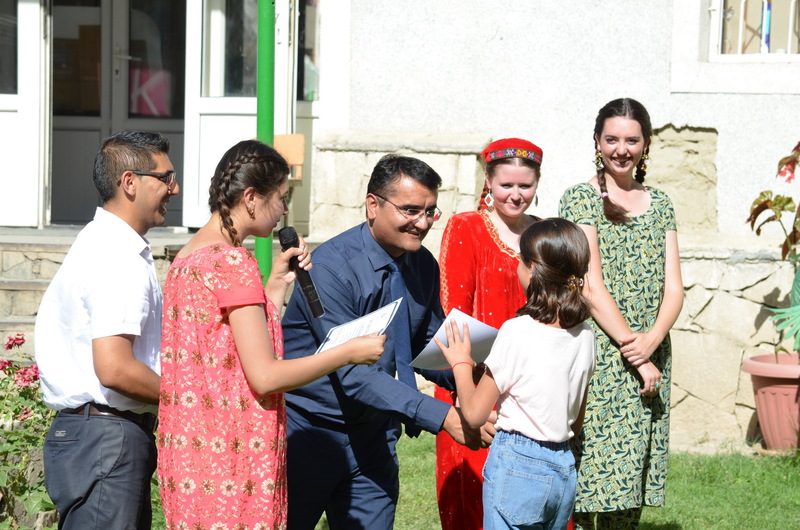 This is the first such programme that has been launched in Tajikistan, and from the reaction and feedback of students, parents, and the Aga Khan Lycée, has been a tremendous success. “The learning from this will be incredibly vital to us continuing this programme as an after-school programme during the upcoming academic year, and its expansion for the following summer and beyond to other Aga Khan Education Service units," said Aziz Batada, AKES (Tajikistan and Kyrgyzstan Regional Head of Education). Indeed, Faith acknowledged the difference she saw in the students over the course of the programme. "A skill that I saw a great deal of improvement in was their creativity... And some parents even remarked on their child’s increased creative thinking around the house when it came to problem-solving or thinking of what they would like to do," Faith said. Students engaged in weekly projects, including working with paper circuits, bots, light paintings, animation and movies, virtual reality, and 3D printing. They also built roller coasters using the concept of gravity and calculated the velocity of a ball as it traveled over the track, created solar powered ovens to melt cheese, and built their own battery-powered fans. Participants receive certificates upon completion of the summer Makerspace Lab programme from Zuloby Mamadfozilov, AKES Tajikistan's CEO, and the programme facilitators, Faith Harron and Allison Armstrong. Allison remarked: "Throughout the summer, these students greatly enjoyed activities such as building a desktop fan, and using the power of the sun to melt a sandwich. 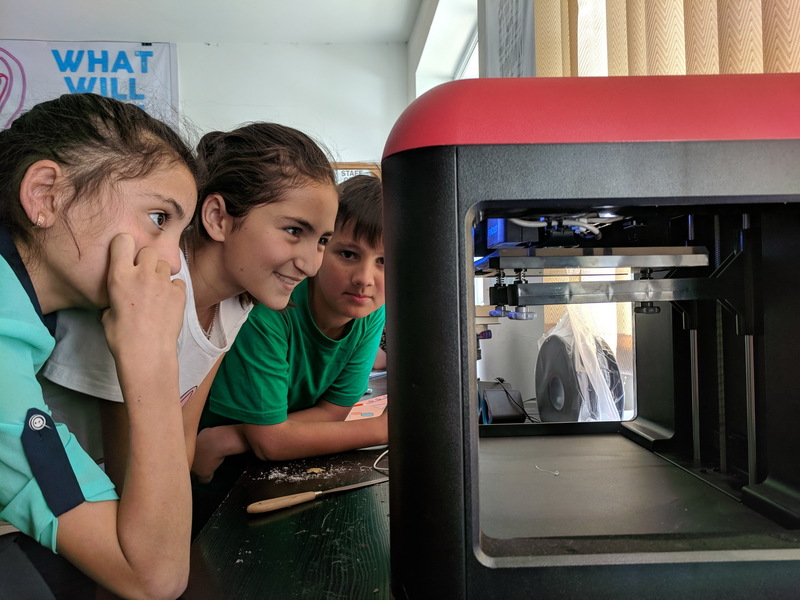 They created models on an application called Blockify, and saw a 3D printer bring these objects to life—the first 3D printer in all of Badakhshan. They also saw how virtual reality can change the way we experience videos and places to which we cannot travel, like space." During the final week, students worked on self-directed projects that would positively impact their communities using the ideas they learned, and then presented their efforts at an exhibition for families and the community in Khorog. It was clear that the students were genuinely interested in the programme, said Allison., "It wasn’t as if their parents had signed them up just to get them out of the house during the summer. The kids and their parents both were so invested in learning and making." Every Friday, after a week of more structured classes, students engaged in an optional session called "Open Make," where they could assemble whatever they wanted with the materials available. Allison said she "expected maybe two or three kids to show up, because, after all, it was summer and kids usually don’t want to be in school during the summer if it’s not mandatory." So, walking into class on that first Friday, she was "amazed to find the Makerspace filled with almost all 40 students who had enrolled. It was so chaotic, but it was incredible." Allison’s experience in Khorog also confirmed her lifelong passion: "As I was walking one day I was hit with a sudden realisation of how much I loved to teach, " she said. "Not only did this trip provide me with interesting experiences and lasting memories, but it has provided me with guidance on what I want to do with my future."